Engage the entire class at every session with our Tissue Paper Ream Assorted. Designed to offer your business an economical option, these high quality tissue sheets come in an assortment of vibrant colours. They are suitable for everything from cutting and folding through to crinkling and promise not to tear - perfect for professional and amateur tasks. Each sheet is made from an 18 gsm paper and can be incorporated into your projects in a range of different ways. From glueing to painting and general manipulation, they are a practical option for classes and groups of all sizes. High GSM base paper is perfect for use with different adhesives. 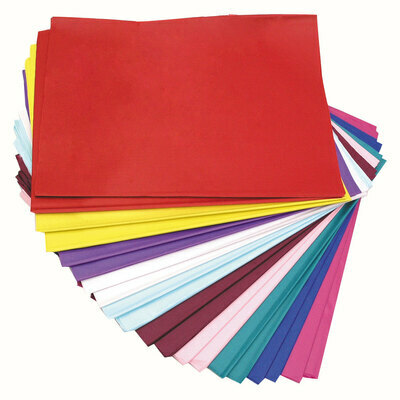 For those needing a smaller pack size, our Tissue Paper Pack Assorted 20 Sheet is a highly economical option. If you're looking to extend your resources, we also have items including our 12 Block Watercolour Paint Set, MDF Modelling Boards or our Children's Play Apron Red 70cm.